With every call about an animal, whether it's injured or being a nuisance, the history is critical in helping us determine the best course of action. In this case, it was odd for an opossum to be causing such damage - they are simple animals, slow moving, quiet and clean (great tenants) - they don't really carry diseases to worry about and they do a good job of taking care of rats and mice (REALLY great tenants!). Why was this opossum behaving this way? As with all intrusion dilemmas, we want to figure out exactly how an animal is intruding - how it's get through and into a structure. After asking the resident a number of questions, we determined the door to the storage room had been left open to air out, and it must not have been shut before nightfall. In walked the curious marsupial, and, at some point, without knowing there was a visitor inside, the door was shut and locked. The mother of nine might have enjoyed the sheltered space while she slept through the first day of imprisonment, but by nightfall, the nocturnal animal began looking for a way out. She was probably more panicked the second night, and in her desperate attempts to find an exit she toppled bags and boxes, alerting the humans of her presence. Thankfully, we arrived in time. 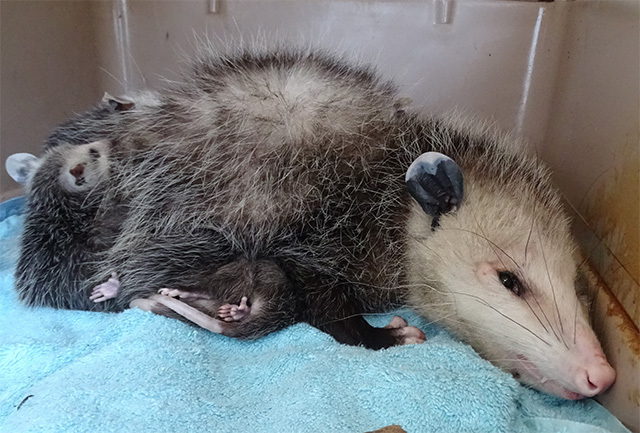 The mother opossum was alive, but starved. Skin and bones, having sustained her 9 nursing babies with nothing to eat or drink for at least two days, possibly longer. The mother and joeys were safely crated and transported to the nearest wildlife hospital where she received subcutaneous fluids and a soupy meal. To prevent entrapments, never block holes or openings into buildings without making sure there're no animals inside. One way to check to see if there's activity - an animal coming and going, is to lightly block a potential entry point with a wad of newspaper. After 24 hours, check to see if the newspaper has been disturbed. If so, you know you got an intruder. Give us a call to safely remove it. UPDATE: She made it! The mother opossum has recovered and will be released back to the wild. 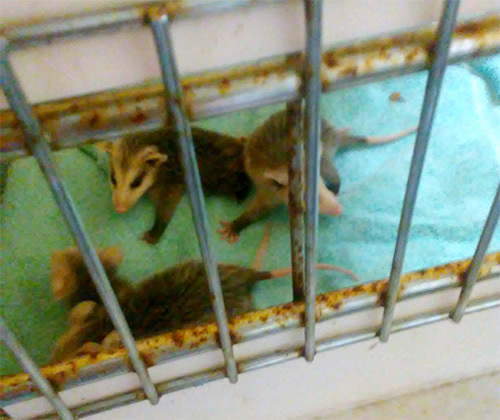 To help offset the cost of caring for this mother opossum and the hundreds of wild animals NAR will rescue and treat this year, please consider sending a donation or click HERE.